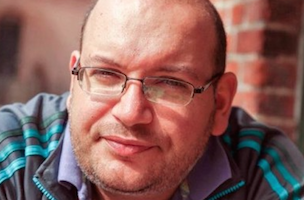 For more than half a year now, The Washington Post's Jason Rezaian has been detained in Iran on unknown charges. Yesterday, however, the state-run Islamic Republic News Agency reported that the journalist will stand trial "soon"
For more than half a year now, The Washington Post‘s Jason Rezaian has been detained in Iran on unknown charges. Yesterday, however, the state-run Islamic Republic News Agency reported that the journalist will stand trial “soon,” but remained vague on the unspecified charges of activities outside the bounds of journalism. According to the IRNA report, Gholam Hossein Esmaeili, a senior judicial official, claimed Rezaian would “be put on trial in Iran soon,” but no official date has been set. Esmaeili went on to say that Rezaian “is in touch with his family and allowed visits while in jail,” however, The Post’s bureau chief in Tehran, has been without legal counsel throughout his detention in Evin prison. The Iranian-American journalist, along with his wife, Yeganeh Salehi, and two photojournalists were detained back in July — all have been released with the exception of Rezaian.